"Be sure to see Walnut Canyon's ancient Sinagua cliff dwellings!" 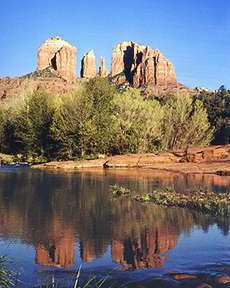 "Spend a few days in the red rock country of Sedona!" "Flagstaff's old town has great shops and restaurants!" "Don't miss the sunset views of the Grand Canyon from Hopi Point!"  advice, advice, advice. The suggestions of our Arizona friends were welcome, but, at the time, the task of planning our vacation felt overwhelming. 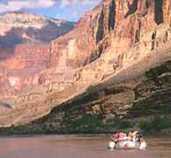 an awe-inspiring tour of the Canyon and Arizona's Colorado Plateau region. This "loop" is really a "lasso" shape. The tour goes north from Phoenix on I-17, returning on the same route. The great sites of the Colorado Plateau are toured in a counterclockwise circle with three days each at Flagstaff, the Grand Canyon, and Sedona. The itinerary starts with top-rate lessons in the geology of the plateau and canyon, as well as Southwest Native American history and culture. After the highlight of the Canyon itself, the tour ends with a "vacation from your vacation" in uniquely beautiful and relaxing Red Rock Country. The famous U.S. Route 66 railroad town is only a three-hour drive north of Phoenix. 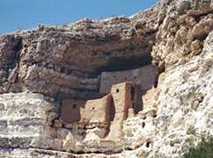 On the drive up, be sure to make a half-way-point visit to Montezuma's Castle, just off I-17. 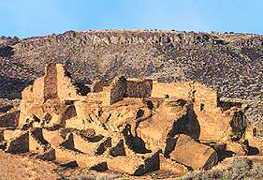 The five-story, 20-room dwelling built by ancient Sinagua farmers in the 1100s sits in a cliff recess, a hundred feet above the valley floor. You'll rejoin the route north wanting to learn more about Southwest cultures. Flagstaff is home to the Museum of Northern Arizona. 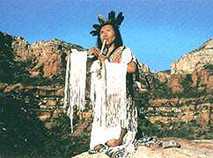 This makes a good first tour stop, since it provides a perfect intro to the natural sciences and native peoples of the Colorado Plateau. In a two-hour visit you'll learn the geologic story of the Grand Canyon, as well as the anthropology, culture, and art of the ancient Anasazi and Sinagua peoples and today's Navajo, Hopi, and Zuni communities. 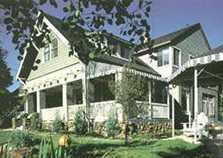 A great way to enjoy Flagstaff is a stay at comfortable and quiet Inn at 410 on Leroux St., a few short blocks away from the energetic, restored old town center. You'll be treated to tasty breakfasts and be close to great dining at Chez Marc, Cottage Place, and Pasto. Renting bicycles at Absolute Bikes on San Francisco St. provides for a good way to explore the town. You can use the Urban Trail System with pathways through interesting Northern Arizona University campus. Drive north from Flagstaff along U.S. 89, turning west at the town of Cameron on State Route 64 westward to the east entrance of Grand Canyon National Park. A short drive brings you to breathtaking views of the Canyon at Desert View. Climb the lookout station for scenes looking northward up the Colorado River and east to the Painted Desert. The afternoon is yours to tour the lookouts along Desert View Drive, including Navajo, Lipan, Moran, and Grandview Points. Every view will be unique, as the mood and scene changes continually with the angle of the sun and atmospheric variations. Another interesting stop is Tusayan Ruins where an Anasazi tribe of about thirty people lived in the 1100s. The El Tovar hotel at the rim in Grand Canyon Village (expensive) or a hotel in the village of Tusayan (moderate) makes for convenient lodging. The next two days are yours to explore the Canyon according to your talents and desires. If youre fit and raring to go, hike down the walls of the Canyon via one of the descending trails, such as the nine-mile Bright Angel Trail. Phantom Ranch near the river provides tented bedding (one-year-advance reservations) before your climb back out of the Canyon the next day. For less demanding hiking, stay at rim level and take the Rim Trail west from Mather Point as far as Hermits Rest, nine miles distant. Hermit Road is closed to auto traffic, and shuttle buses are provided to allow access for non-hikers to the major viewpoints such as Maricopa, Hopi, Mojave, Pima, and Hermits Rest. A good option is to rent a mountain bike in Flagstaff and pedal along Hermit Road, stopping at viewpoints and hiking where you desire. Some of the best Canyon views along Hermit Road are the "Pyramids" and "Temples" of layered, sculpted stone that rise from the Colorado River towards the North Rim, ten miles distant. They are all named for Egyptian gods, such as Cheops, Isis, Shiva, Seth, and Ra. A Grand Canyon highlight is Hopi Point in the late afternoon with its 270-degree views of steep canyon walls and buttes gloriously outlined in shadow. Where you can see the river a full mile below the rim, you are looking at the oldest exposed rock on earth. 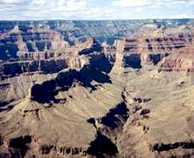 Try to discern the ten layers of geologic time, starting with Kaibab Limestone dating back 250 million years at the rim, and descending through nine layers to the Vishnu Schist, two billion years old. 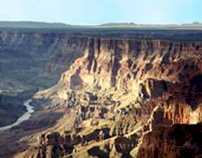 The river has taken twenty million years to slice this grand gorge since the Colorado Plateau first began to lift upward. Now its time to head southward on US 180 past Humphreys Peak back to Flagstaff. You can then take State 89A, descending from the Colorado Plateau through gorgeous Oak Creek Canyon to Sedona. Its worth a stop for the views at Oak Creek Vista and for the natural Oak Creek water slide at Slide Rock. The unique red rock that makes Sedona world-renown is everywhere around you. When you arrive at Sedona, settle into your lodging and get ready to relax. Since this is a "vacation from your vacation," its the perfect opportunity to splurge. The Enchantment Resort, situated in beautifully isolated Boynton Canyon, makes for a perfect retreat. Here youll be able to hike in Long, Boynton, and Fay Canyons or travel to Sedona to browse the myriad arts and crafts shops of Tiaquepaque Village. The village of Oak Creek, five miles from Sedona, provides great mountain biking and hiking around Bell Rock and along Verde Valley School Road. A Sedona highlight is taking the Red Rock Loop Road to admire the sunset views of Cathedral Rock from Crescent Moon Park on Oak Creek. Some photographers make it a lifetime challenge to get the "best ever photo" of this entrancing sight. Cathedral Rock, reflected in Oak Cr. A relaxing day of lying by the pool, hiking, shopping, or exploring leads well to a delectable dinner at the Enchantments Yavapai Restaurant. Even if you dont stay at Enchantment, its worthwhile to make a dinner reservation and enjoy the 180-degree canyon scenery and Southwest cuisine. 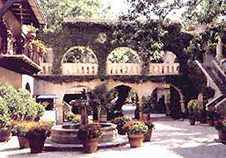 Other good restaurants in Sedona include Dahl and DiLuca, Pietros, and Spices. The three days of relaxation may slip away all too soon before its time to take the two-hour drive south on I-17 back to Phoenix. Youll almost certainly leave Sedona with a taste for Red Rock Country added to that for the Grand Canyon and Flagstaff. As memories of your grand Grand Canyon tour begin to play across your mind, the desire to return soon will start to grow. Click here for details to plan your own trip to the Grand Canyon, Flagstaff, and Sedona.